Agriculture plays a major role in the economic sustenance of Bangladesh, contributing to nearly 19% of its GDP, compared to less than 5% for the world. 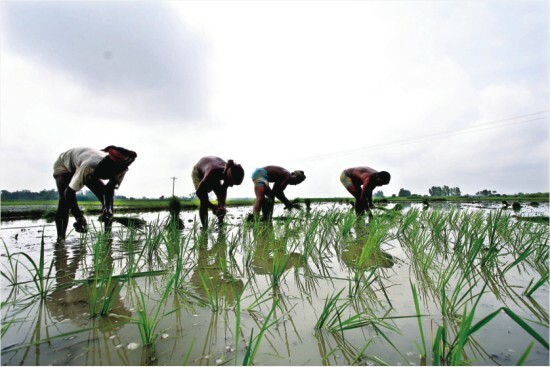 The agricultural sector also employs more than half of the labour force of Bangladesh and the performance of this sector has considerable influence on overall economic growth and the level and status of poverty and malnutrition. Estimates show that GDP growth originating in agriculture is, on average, at least twice as effective in benefiting the poorest half of the country's population compared to growth generated in non-agricultural sectors, making agricultural growth especially effective in reducing poverty. 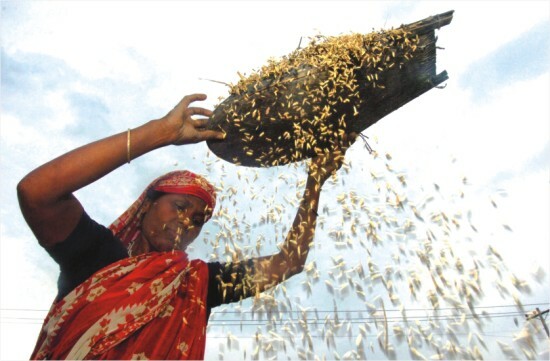 Over the last three decades food grain production in Bangladesh has been more than doubled. In spite of increased average (national level) uptake of calorie level, large-scale malnutrition still persists. This situation has been aggravated by the recent global crisis and the striking rise in food prices. The poorest section of the Bangladeshi populace, who used to spend 49% of their income on rice in 2006, spent 62% on rice in 2008. Despite the claim of self-sufficiency in food, occasional imports create confusions. Import of food increased from $413 to $1,918 million between 1987 and 2007. In July 2008, Bangladesh announced a plan to import 1.2 million tons of rice grains from the international market in one year. Self-sufficiency in other food-items is yet to be achieved. The per capita consumption of meat, milk, and eggs, particularly by the rural consumers, falls far short of the requirement. 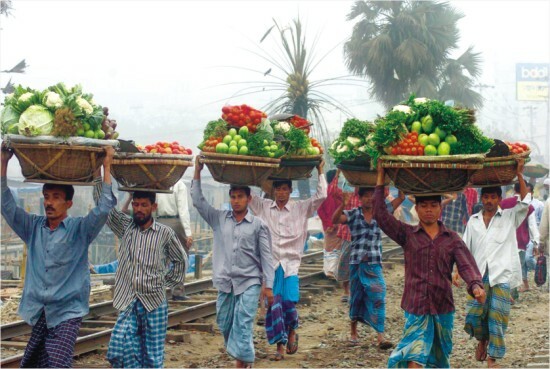 Substantial improvements in the Bangladesh diet will require greater diversification of agricultural production. In addition, urbanisation is leading to major changes in dietary patterns. This certainly necessitates a more subtle analysis of the future national demand for food and a more intuitive plan for meeting these demands. The fourth Assessment Report of the Intergovernmental Panel on Climate Change (IPCC) states unequivocally that global warming is occurring and continued greenhouse gas emissions at or above current rates would cause further warming and induce many changes in the global climate system during the 21st century that would very likely be larger than those observed during the 20th century. Bangladesh is increasingly becoming more vulnerable to natural disasters due to extreme climate events and its high population density. Flash floods, increasingly higher temperatures, more variable precipitation, and extreme weather events such as droughts, and storms, sea level rise are already being felt in Bangladesh and will certainly continue to intensify in future. Climate unpredictability will make planning of farm operations more difficult. Crop yields are predicted to fall by up to 30 percent, creating a very high risk of hunger. 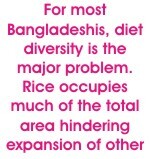 For most Bangladeshis, diet diversity is the major problem. Rice occupies much of the total area hindering expansion of other crops. Rice yields must be improved to facilitate expansion of non-rice crop areas while maintaining adequate rice production. Rice is subjected to salinity constraints in the coastal areas, affected by water submergence in tidal and wetland areas and drought, particularly in the northwest region of the country. Insects and diseases are also reducing rice yields significantly. Fewer acres and deteriorating soil conditions have put pressure on farmers to produce more rice under increasingly difficult conditions and with fewer resources. Bio-technology can help in overcoming these problems. Results from the experiments that do exist are promising. For example, in a collaborative effort between India and Bangladesh, a system has been designed such that relevant gene(s) in bio-engineered plants are specifically "turned on" when the plant is under drought or salt stress. A single technology is applicable to address two individual constraints: drought and salinity. Major rice pests in Bangladesh include the stem borer and brown plant hopper and the major pathogens are the tungra viruses, bacterial leaf blight, and blast. Transformation of rice with the bacillus thuringiensis toxin gene, Bt, or resistance gene(s) from wild type species, or viral coat proteins may protect from pests and pathogens and reduce yield loss significantly. Wheat production, which is constrained by drought in upland areas and salinity and flooding in coastal areas, may be increased following similar strategy for rice. Jute, the most important fibre crop of Bangladesh, is damaged by blight, insects, and flood. 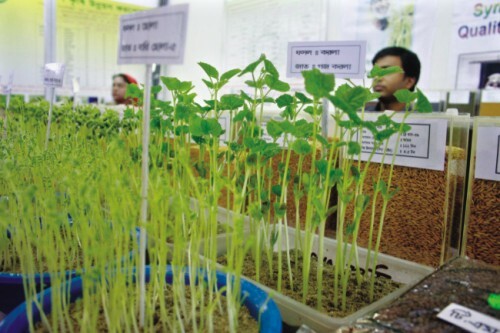 The germplasm depository (gene bank) at Bangladesh Jute Research Institute (BJRI) has a collection of 5935 accessions of 53 species of fibre plants. Some of these germplasms have useful traits as resistance against diseases and pests, which may be exploited for improvement of commercially important varieties. In Australia and France transgenic plants with reduced lignin content have been produced by manipulating the enzymes of the lignin pathway. If this can be done in jute, the quality of jute fabric would be enhanced so much that jute will be in a position to compete with cotton. Harnessing the rapid growth of naturally fast-growing jute and its cultivation in the winter through genetic manipulation may lead to diversified and eco-friendly use of jute in different industries such as paper. It would lead to use of jute as better quality geo-textile, substitute for wood and woodchips, as an important gradient in the garment industry and finally, as a potential source of bio-fuel. As a way to overcome the general deficit in protein-based calorie uptake, nutritionists of Bangladesh often emphasise on inclusion of pulse in our daily diet. The major problem with pulse (lentils) production in our country is fungal infections, which affect all available native varieties. Identification and introduction of resistance genes into lentil varieties may reduce yield loss due to fungal infection. Eggplant, another important vegetable in Bangladesh, which is grown by an estimated 8 million farmers, suffers from insect (borers) damages by up to 70%, pushing the farmers to an excessive use of pesticide (up to 250300 sprays per year). This practice has immediate, as well as long-term, harmful effects on the environment and on the health of the farmers, apart from the considerable increase in production costs. In a collaborative effort among Bangladesh, India and Philippines, a gene from bacillus thuringiensis has been introduced into eggplant and found to be effective and this variety is under contained field trial in Bangladesh. In another collaborative effort among Bangladesh, India and Indonesia, a resistance gene isolated from a wild relative of potato (solanum bulbocastanum) has been transferred to popular varieties that are normally affected by late blight to confer resistance against the disease. According to some researchers stem borer has almost shut down the sugarcane industry, reducing greatly its production. Experimental success with other crops indicates that similar success can be achieved with sugarcane, too. In addition to solving the major biotic and abiotic constraints, bio-technology may bring other benefits to our farmers. Scientists have engineered wheat and other crops that can utilise fertilisers more efficiently. One such transgenic wheat variety, for example, yielded up to 29 percent more with the same amount of fertiliser than did the normal crop. This brings hope for less quantity, more efficient and more economic use of fertilisers and less environmental pollution. Advanced field testing of Bt rice in China shows higher yields and a 80 percent reduction in pesticide use. 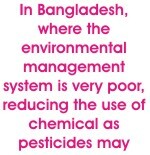 In Bangladesh, where the environmental management system is very poor, reducing the use of chemical as pesticides may lessen the burden of pollution. Aquaculture industry of Bangladesh has the potential to provide food rich in vitamins, fatty acids, and proteins, and to create new jobs, enhance income, and enable high returns of the use of natural resources. Researchers around the world have recorded growth acceleration and increased feed efficiency in transgenic fish species. Recombinant growth hormones, vaccines and veterinary bio-pharmaceuticals may increase yields of farm animals, too. Poultry industry is severely suffering from various infectious diseases. Imported vaccines and drugs are often not suitable for the local infectious strains. So, there is scope to do a lot in this particular field of research and bio-technology will definitely help us in improving our livestock. Genetic improvement of micro-organisms for industrial production of food supplements, drugs, vitamin, hormones, bio-fertiliser, bio-insecticides, solvents and other chemicals, which are now imported from abroad, will allow us to produce these here with our own expertise. Bioconversion of agricultural wastes into food, feed and fuels might be an important area of application in Bangladesh. Development of efficient activated sludge process for waste treatment, development of organisms for treatment of industrial pollutants, xenobiotics, etc. should get research priority here. Modification of micro-organisms or plants through the introduction of genes controlling the degradation pathways may enhance bio-remediation. For example, a research team has been able to introduce bacterial genes into plant genome for conversion of toxic mercury into its less dangerous volatile form. Rising global energy demand poses a real and growing threat to the world's energy security. Fossil fuels will remain dominant, accounting for 84% of the projected increase in primary energy demand. Estimates for global production of fuel ethanol indicate that it has tripled from 2000 to 2007 to reach 52 billion litres. Bio-diesel production has increased from less than 1 billion litres in 2000 to over 10 billion litres in 2007. These data provide a number of very important indications. The accumulative production of CO2 will not decrease, but only the rate will be slowed down. The climate will still worsen, but more slowly. Finding an alternative low cost energy source is the ultimate goal, however, there is no such alternative. We have to move for bio-fuel, even if we have much less cultivable lands and may get, if any, less food aid in future, as much of the aids will be gone for fuel production by the donor countries. In 2008 Bangladesh spent around 12% of total national budget to subsidise fuel, food, and fertiliser. Decreasing importation of fuel may save national budget. Brazil, leading producer of bio-ethanol, saved some $52 billion in avoiding oil import between 1975 and 2002. Though, bio-fuel is often considered as a blessing for tropical developing countries like Bangladesh for comparative advantages of sun and excellent energy crops, this simple prediction might be complicated by the uncertainties in climatic behavior. Engineered plant varieties with enhanced adaptability with higher content of fermentable sugars may overcome many of these uncertainties. Developing countries like Bangladesh have a markedly different profile of the type of bio-pharmaceuticals consumed compared to US or Europe. Whereas erythropoietins, oncologics, anti-diabetics and auto-immune agents constitute the bulk of biopharmaceutical sales globally, the leading therapy classes here are anti-diabetics and vaccines. The simple truth is that many bio-pharmaceuticals, such as oncologics, are simply too expensive for widespread distribution in countries with low healthcare expenditure like Bangladesh. Access to the more expensive treatments continues to be restricted here. The much vaunted pharmaceutical industry in Bangladesh has much responsibility for bringing these out-of-reach bio-pharmaceuticals to the reach of the poorest section of the country. Though the worldwide market for bio-technology pharmaceuticals was estimated around $80 billion in 2007, representing 9.6% of the total global pharmaceutical sales, biopharmaceutical companies here seem to be reluctant in expending on research on less focused endemic diseases. For example, salmonella infection is highly endemic in Bangladesh and is an important cause of high morbidity and economic loss. We have high incidence of tropical skin diseases, heart diseases, tuberculosis, dengue and others. Recombinant DNA based diagnostic kits, drugs and vaccines may be developed for endemic diseases to make diagnosis and treatments available for all. Due to their potential for producing more affordable food and for mitigating some of the challenges associated with climate change, bio-tech crops are also gaining increased support from organizations such as the G8 countries, the European Commission and the World Health Organisation (WHO). WHO has emphasised the importance of bio-tech crops for their enormous potential to bring benefits by providing more nutritious foods, decreasing their allergenic ingredients and also improving the efficiency of production systems. Our neighbouring country India can be an example for us for adopting genetically modified crops in agriculture. In India, 54,000 farmers grew 50,000 hectares of Bt cotton in 2002. Six years later in 2008 the Bt cotton cultivated area soared to 7.6 million hectares by 5 million farmers, with a 23% growth rate between 2007 and 2008. Bt cotton now occupies 82% of total cotton sown in India. On an average, conservative estimates of benefits for small farmers indicate that yield increased by 31%, insecticide application decreased by 39%, and profitability increased by 88% which is equivalent to $250 per hectare. India is also one of the major producers of bio-fuel now. Needless to say that the political will and support for bio-tech crops in India is very high. The National Bio-technology Policy of Bangladesh provides emphasis on generation of transgenic crops/agro-forestry plants with improved traits, bio-tech derived therapeutic/diagnostic kits, drugs, anti-biotics, and vaccines for animal husbandry, improvement of animal nutrition by application of modern feed bio-technology, development of genetically manipulated fish for enhanced growth and disease resistance, development of genetically engineered vaccines against devastating fish/shrimp pathogen, etc. In order to implement the bio-tech policy the National Institute of Bio-technology (NIB) has to be made vibrant and competent. In the last few years local and expatriate bio-technologists have made many recommendations and suggestions as to how to make NIB the kind of institute it should be. The Green Revolution brought high-yielding semi-dwarf wheat and rice varieties to millions of small-scale farmers worldwide. In spite of initial wide skepticism, the Green Revolution taught us that technological innovation can bring enormous benefits to the poor through enhanced efficiency, higher incomes and lower food prices. The countries that could reap most of opportunities presented by the Green Revolution were those that had, or quickly developed, strong national capacity in agricultural research to make the necessary local adaptations to ensure that the improved varieties suited the needs of their farmers and consumers and this remains true even today for new bio-technologies. For more than a decade, bio-tech crops have consistently performed well and delivered significant economic, environmental, health and social benefits to both small and large farmers in developing and industrial countries. Much of the previous confusions have already been eroded and the scientific communities are concerned to wipe away the existing confusions in near future. Accordingly, bio-technology holds great promise for bringing revolution in agriculture, healthcare, industrial processing, and environmental sustainability for our country, too. However, with an ever-decreasing arable land area and more vulnerability to climatic challenges and increasing unpredictability in agricultural practices, we also need to give more emphasis on sectors of possible economic growth that require less land. We need a shift in balance between an agriculture- and non-agriculture based economy. Small scale bio-technology-based industries, which is most suited for the country, therefore, must also be encouraged for more balanced economic growth. Abu Ashfaqur Sajib is Lecturer, Department of Biochemistry and Molecular Biology, University of Dhaka. Haseena Khan is Professor, Department of Biochemistry and Molecular Biology, University of Dhaka.